At Boothster, our philosophy is that design and the aesthetic of specific sustainable materials have the ability to celebrate positive action; and inspire our future. We are proud to use eco friendly and sustainable materials in our tradeshow booth designs, banner stands and signage. Boothster has provided exceptional award winning tradeshow booth designs for a vast array of socially responsible organizations. People in public service are really are fighting the good fight in the name of social responsibility and sustainability and that’s the story we tell in every booth we design. Boothster's award winning custom tradeshow booths have provided exceptional results for organizations in almost every industry. From the Food & Beverage Industry to the Pet Industry, Baby Products, Software and World Expos, Boothster provides eco friendly booths and expo designs that will get your organization noticed! Award Winning, Eco Friendly, Custom Tradeshow Booth Designs for Companies and Government Organizations Large & Small! Boothster is proud to have worked with GoMacro on the award winning “Best Medium Sized Booth” at the Canadian Health Food Association West tradeshow that just wrapped up on April 7, 2017 in Vancouver British Columbia! Boothster was founded to work with companies like GoMacro, who have a passion for healthy lifestyles and sustainable business practices, to create green, reusable and recyclable custom tradeshow booths, banner stands and signage that get the message out to potential customers, clients and consumers while maintaining consideration for our impact on the environment. The Boothologists are Excited to Accompany Our Clients to the Global Pet Expo! Boothster is a green tradeshow booth display company that provides eco friendly booths and expo designs for natural products companies and government organizations of all sizes. Offering a unique blend of high concept booth design ideas, and innovative off the shelf vertical banner stands made out of green materials, Boothster has provided exceptional results for a vast array of socially responsible organizations. Our cool products include table runners, bamboo banner stands, a unique eco friendly modular booth system and Booth Design Ideas for companies exhibiting at trade shows and events. 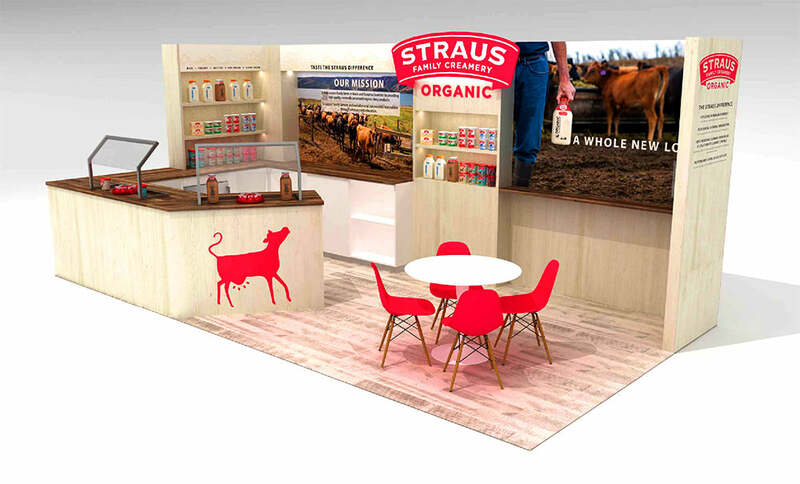 Be Sure to Check Out All Our Fantastic Booth Design Clients at Natural Products Expo West! At Boothster, our philosophy is that design and the aesthetic of specific sustainable materials have the ability to celebrate positive action; and inspire our future. We use materials that are visually beautiful, sustainable and biodegradable. We are, bar none, the most sustainable portable display company in the world. Our designs are works of art that engage attendees, and are a catalyst for conversation and sharing of ideas. For the past decade, Boothster has been producing green tradeshow booth displays and exhibits for government organizations and eco-conscious companies that believe in presenting a socially responsible image. It’s not too early to start designing your custom ecofriendly tradeshow booth for the Outdoor Retailer Show! The set up is as easy as danicng to hip hop. Check it out.